HiVol, LUX and Multifam guests will each take in dedicated session content designed to help them take their business to the next level with tech. The TecHome Builder Summit, taking place in Phoenix, Ariz. Dec. 4-6, again will be delivering general sessions that will inform and inspire guests to make the next step forward in tech. 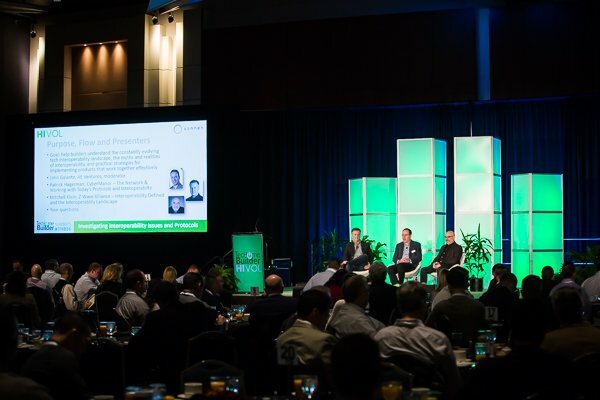 This thought-provoking content, provided largely by market leading design/build peers and trade allies, is a significant part of what makes the Summit the tech strategy event for the nation’s top homebuilders. HiVol, LUX and Multifam guests each will have their own content tracks, including sessions on topics tailored specifically toward their needs and aspirations. Each track also includes the Summit’s signature roundtable sessions, which drive guests to jointly brainstorm new ideas and strategies and share best practices. Looking for the business case for a sustained investment in delivering the TecHome? Look no further than this session. We’ll cover how technology can help builders steal market share from the existing home market, how it can help builders win the business and long-term loyalty of millennial buyers, how it can increase per home revenue and profit and how it can deliver post-occupancy recurring revenue. It all adds up to the rationale you need to justify your investments in developing a tech strategy and the ecosystem of vendors and contractors you need to execute on it. How do you push the envelope on technology with luxury buyers? Just like you do with any other feature of the home. Show them the coolest tech plays that luxury buyers are making, paint the picture of the experience and work with your tech partners to actually deliver it. This session provides a glimpse at award-winning luxury tech projects and explores the ways you can leverage examples and experiences to get your clients to go big on tech. What are the elements of a multifamily home technology master plan? How does it increase the probability of tech making a difference in the sale and rental of units? How does it increase the ultimate satisfaction of residents? Who can help you develop and implement your plan? How do you develop tech plans for public spaces that are complementary and harmonious with the tech that you include in units? We’ll get on top of these and other questions in this first-of-its-kind session. For a complete schedule and descriptions of the general sessions, click here. To apply as a hosted guest, contact Kaleigh Barrasso at kaleigh@ae-ventures.com or 508-802-4715. For sponsorship opportunities, contact Jeff Verklan at jeff@ae-ventures.com or 508-618-8333.